Submitted by BellesAZ on February 20, 2015 – 9:17am. So, I buy my flour from a Utah mill called Honeyville – their bread flour is so flavorful and in my limited opinion, superior to just about any I’ve ever tried. I get emails occasionally from them and this time, it was a link to a bread they made using popcorn from an air popper. It is ground into a fine meal and added to the formula. I haven’t tried it, but I’m a bit curious now. Using any air popper of your choice, pop 1/2 cup popcorn. This should give you around 7 cups of popped corn. Place popped corn in a food processor or blender and process until a fine powder forms. In your BOSCH Universal Mixer, add the following ingredients in this order: water, butter, sugar, salt, egg, processed popcorn, yeast. Turn mixer to #2 setting and, while dough is mixing, slowly add flour 1 cup at a time until dough begins to pull away from the sides. Knead in machine for 3-4 minutes, or until dough is soft. Remove dough from mixer and place in a greased bowl, cover, and let rise for 40 minutes. Once risen, punch down dough, remove, and divide into 2-3 loaves. Shape and place in your Norpro 8 x 4 1/2 pans, then let rise for 30 minutes. Once risen, slice the tops of loafs, then brush with an egg wash of 1 egg and 1 Tbsp water, whisked together. Place in 400 degree oven, knock temperature down to 350 degrees, then bake for 35 minutes. Remove and allow to cool on a wire rack before slicing and serving. 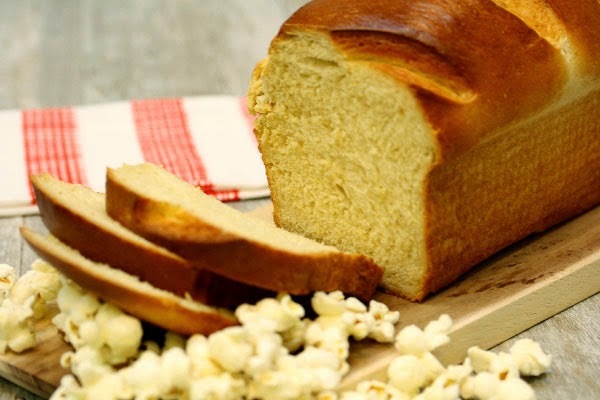 This bread bakes up light, fluffy, and full of all the taste we love about popcorn and bread! The coloring is simply amazing, and each slice reveals a fantastic display of kernels and colors, blended to perfection! Serve this up with some melted butter or enjoy with some homemade jam. Either way, you’ll simply love the taste!